Analysts say that even if and when a deal is reached, China's communist leaders will find it extremely difficult to convince party cadres, local industries and the public of the merits of a deal. 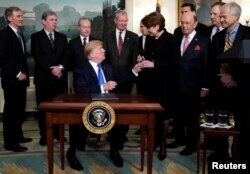 President Donald Trump, surrounded by business leaders and administration officials, gives the pen to Lockheed Martin CEO Marillyn Hewson after signing a memorandum on intellectual property tariffs on high-tech goods from China, at the White House. From the Chinese point of view, "it sounds like the U.S. is trying to impose an unequal treaty on China, which reminds many in China of the 'Century of Humiliation' when the declining Qing Dynasty had to accept unequal treaties imposed on China by foreign powers," said Zhiqun Zhu, a political science professor at Bucknell University in Pennsylvania. "I think it will be politically dangerous if the CPC does not put up a strong resistance (to Washington) and seek a fairer deal with the U.S.," he said. 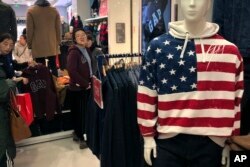 FILE - A woman tries out a sweater at U.S. retailer GAP's flagship store in Beijing, Jan. 10, 2019. For the rank and file of China's Communist cadres, there is an expectation Chinese leadership will match the United States in political strength and negotiation capability. Some even see the trade war as a tussle between Presidents Xi Jinping and Donald Trump. "The U.S. demand that China genuinely move toward a market economy is a challenge for any CCP leadership, but is particularly the case for a China led by Xi Jinping," said Scott Kennedy, deputy director of the Freeman Chair in China Studies at the Center for Strategic and International Studies in Washington. That is equally challenging because under Xi Jinping's leadership, China has moved backward in terms of market reforms, Kennedy said. "Previous CCP leaders have adopted policies less inimical to markets, and they did not see marketization as a vital threat to CCP rule the way Xi Jinping apparently does," he said. The U.S. is asking China to address old concerns like industrial subsidies, technology transfer, and intellectual property rights. Accepting these demands would impose a heavy financial burden on Chinese industry because it will result in costly restructuring and an increase in product prices. Price increases can in turn affect China's exports. "China will pay lip service to much of what is being discussed, sign a weak deal, buy some stuff, approve some deals in the short term, but longer term China will be pursuing Made in China 2025, they will be stealing IP (intellectual property) where they can, and they will be treating foreign companies differently as much as they can," he said. "If they (Chinese leaders) don't make the concessions necessary for a deal it will only be because the Chinese leadership has determined that maintaining the place of SOEs and special interests is more important than an amicable relationship with the United States," Kennedy said. "China is run by a Leninist dictatorship which has made no secret of the importance of the party as the core of the society and economy," Howie said.